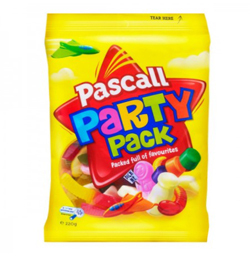 This pack boosts a variety of all your favourite Pascall lollies including Milk bottles, Jet planes, Eskimos, Jelly beans, Jelly worms, Wine gums and many more. Sugar, Glucose Syrup (from Wheat and Corn), Thickener (E1401 from Wheat), Invert Sugar, Gelatine, Food Acid (E330), Flavours, Colour (E163, Spirulina, E100, E160C, E120), Fruit Juice Concentrate, Glazing Agent (Palm Oil, E903). We bought these when my kiwi husband took me to NZ for a months holiday so now whenever we go on a uk road trip we have a bag of these handy!! !